The refreshed products, aimed at holiday sales, come as rival makers such as Apple also roll out updated devices. SAN FRANCISCO — With holiday shopping approaching, Amazon updated its Fire TV and Fire tablet product lines Thursday, refreshing seven devices with the requisite upgrades to keep pace with hardware rivals such as Apple, which have their own seasonal product improvements as well. The new devices sport such refinements as zippier processors and better screens, though no major changes that seem likely to set Amazon apart in either the streaming media device or the tablet markets. The biggest change for Amazon’s Fire TV lineup is the addition of voice control to its low-end Fire TV Stick. That’s the thumb drive-sized gadget that plugs into a TV’s HDMI port and connects to the Web to stream video from Netflix, HBO Go, Hulu Plus and Amazon Prime Instant Video. The $39.99 device, which competes with Google’s Chromecast, debuted last year. Users had to navigate through programming menus with a scroll wheel on the accompanying remote to spell out words to search, or program icons on which to click. Amazon now has added voice control to the gadget, a feature it introduced last year on the $99.99 Fire TV box. “The use of voice really exceeded our expectations,” said Peter Larsen, vice president of Amazon Devices. 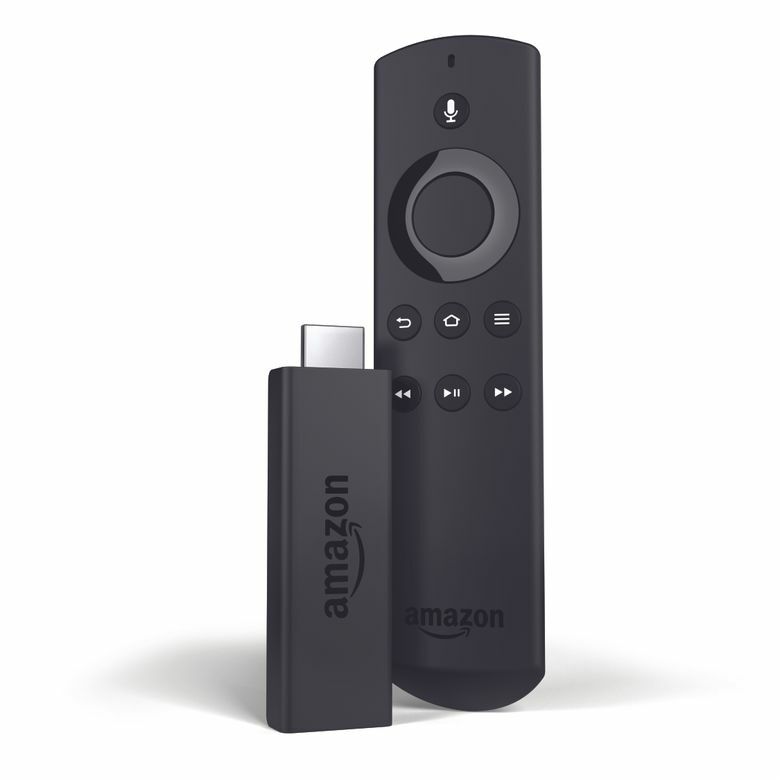 The new Fire TV Stick with Voice Remote will cost $49.99. And Amazon will continue to sell the lower-priced model without voice control. Amazon also has added the voice capabilities of its Amazon Echo, the cylindrical speaker it launched last year, to the Fire TV offerings. So in addition to finding programs, users can also speak into a microphone in the remote to find out local weather, sports scores and traffic updates. Amazon’s digital assistant, which goes by the name Alexa, will respond with answers. An update early next year is expected to add some home automation features, such as the ability to turn on lighting with a voice command. Amazon is not the only company baking ever-increasing voice capabilities into its streaming media boxes. Last week, Apple unveiled its new Apple TV device, which, for the first time, included voice control functions, using its digital-assistant, Siri. Amazon is also adding its Mayday feature to the Fire TV. It’s the feature, introduced in its Fire tablets in 2013, that provides device tech support. Mayday lets confused customers connect to an Amazon representative for help with whatever technical challenges they encounter with their devices. On Fire TVs, customers will have to use a phone to call Amazon for Mayday help. Amazon thinks confounded customers might not be able to figure out how to use the microphone in the remote to make customer support easy. And the Fire TV version of Mayday won’t feature the small video window with the Amazon representative that callers see on the tablet. But that support person still will be able to take control of the device to guide users through their problem. Customers who own the original Fire TV will be able to use the new voice-control features and the Mayday support with a free over-the-air software update next month. Amazon is also updating the original Fire TV to support so-called 4K Ultra HD, the latest standard for high-resolution television. It’s including a microSD slot on the device to let customers, mostly gamers, increase storage, and the updated box supports the latest Wi-Fi technology, 802.11ac. Additionally, Amazon is offering its Fire TV Gaming Edition, which includes a redesigned game controller that’s slimmer than the original version, as well as a 32- gigabyte microSD card and two games for $139.99. The price of Fire TV remains $99.99. Dan Rayburn, a principal analyst with Frost & Sullivan, has played with the new Fire TV and found the new upgrades evolutionary. But he does believe the new lineup keeps pace with rivals and will help Amazon remain one of the primary providers of streaming media devices. Customers can pre-order the devices Thursday. The Fire TV and Fire TV Gaming Edition will be available Oct. 5, while the Fire TV Stick with Voice Control will be out available on Oct. 22. 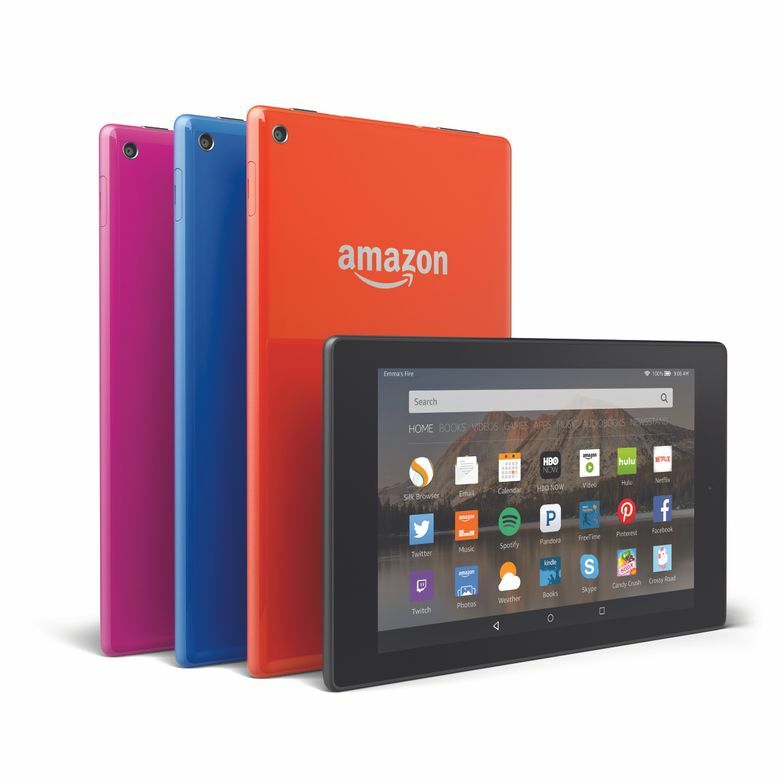 Amazon is also introducing four new Fire tablets. The high-end HD versions have a new industrial design that’s slimmer than current models. The 8-inch model, which starts at $149.99, comes in black, blue, magenta and tangerine. The 10-incher comes in black and white. It starts at $229.99. Like the new Fire TV, the HD devices support 802.11ac and include microSD slots to expand storage capacity. Amazon is also offering, for $99.99, a keyboard with a trackpad for the larger HD model. But Dave Limp, senior vice president of Amazon Devices, said the company isn’t planning to offer a stylus, as Apple plans to on its new iPad Pro. “We looked at it,” Limp said. “It’s more of a productivity use,” which isn’t how Amazon’s customers typically use their tablets. The tablet operating system is also getting an update with a raft of new features. Perhaps the most novel is one that automatically downloads movies for offline viewing. Called On Deck, the feature uses customers’ viewing history to add television shows and movies they might like, in case they forget to download a film, say, before a flight. It uses only available storage. The feature is available only for members of Amazon’s Prime subscription service, though Amazon will add some of the shows it has produced at Amazon Studios for non-Prime members as a way to sell the service. Amazon has also added a feature called Word Runner to help readers move through text faster. Instead of reading across lines and down a page, readers can turn on the feature to read text one word at a time, in a large font in the center of the screen. They can control the speed at which the words appear. Limp said that some studies show that the technique improves comprehension as well. Amazon is also adding a low-cost tablet, simply called Fire, a 7-inch gadget that will sell for $49.99, a new price point for Amazon’s tablets. The Fire tablet will come with a quad-core 1.3-gigahertz processor, which is twice as powerful as the current Samsung Galaxy Tab 3, a device that’s twice as expensive. Amazon also has lowered the price on its Fire Kids Edition to $99.99. The bumper- protected device, which includes a two-year replacement warranty if it’s broken, previously sold for $149.99. Like the Fire TV lineup, the new tablets are available for pre-order Thursday. All four will start shipping Sept. 30.